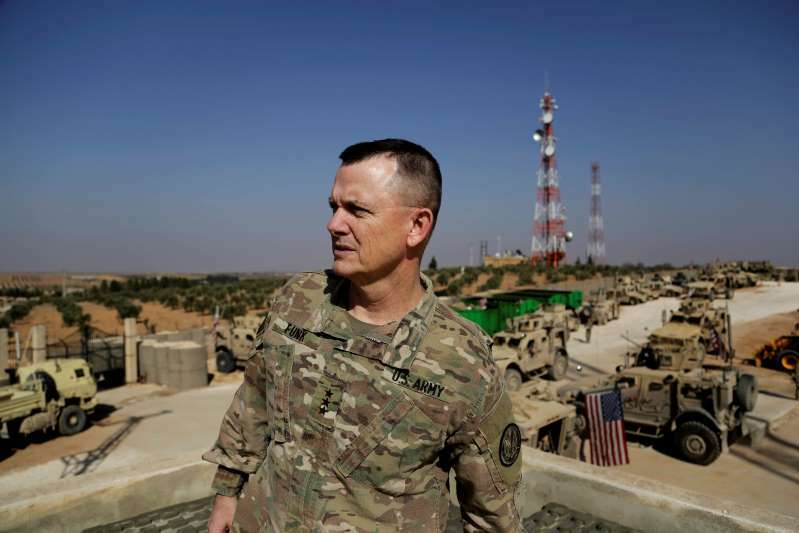 © Susannah George/AP U.S. Army Lt. Gen. Paul E. Funk, shown earlier this year in the northern Kurdish town of Manbij, Syria, is the commander of coalition forces in Iraq and Syria. U.S. Marines conducted a live-fire aerial assault exercise in southern Syria on Friday designed to warn Russian and other military forces to stay away from an American base there. The exercise, involving a company-size unit, came amid rising U.S.-Russia tensions across the Syrian battlespace. The Trump administration has warned both Russia and the Syrian government against a planned offensive in Idlib province in northwest Syria, the largest remaining pocket of rebel fighters who have tried, and failed, over the past seven years to oust President Bashar al-Assad. The garrison has served as a launchpad for U.S. anti-Islamic State operations and a U.S. Special Operations Forces training facility for Syrian fighters aiding in that effort. The zone also lies astride a major transport line between Tehran and Damascus, and control of the area has long been a goal of the Syrian government and its Russian and Iranian allies.